LUBBOCK, Texas (AP) — The effort to clean up soil and groundwater contamination at the nation’s only plant for assembling and disassembling nuclear weapons has been effective so far and will continue for years, according to the first five-year review of the site. 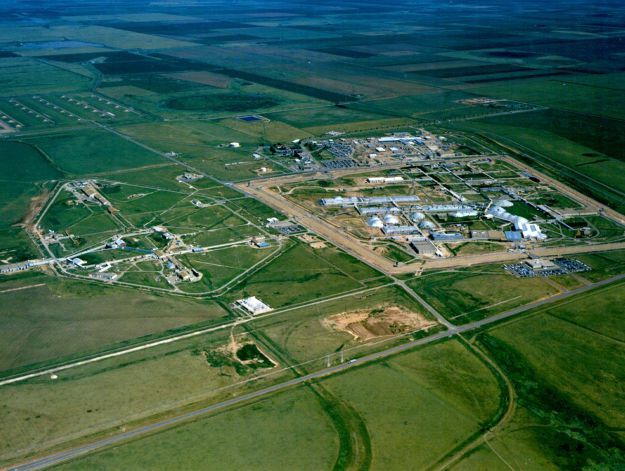 Pantex in the Texas Panhandle was added to the national Superfund cleanup list in 1994 because of past site practices that included burning chemicals in unlined pits, burying waste in unlined landfills and discharging waste into on-site surface waters known as playa lakes. The review says the long-term project is focusing on removing contamination from soil and a shallow aquifer beneath the plant, located 17 miles northeast of Amarillo. “We are already seeing significant reduction in contaminant concentration in parts of the perched aquifer,” said Camille Hueni, who’s overseeing the project for the Environmental Protection Agency. One of the top goals of the cleanup is to keep contamination from reaching the Ogallala Aquifer, which underlies eight Plains states and is the Panhandle’s major source of water for municipal, industrial and agricultural use. The shallow aquifer, or groundwater, is perched as much as 200 feet above the Ogallala. Workers at Pantex assemble and dismantle nuclear warheads for the Department of Energy’s National Nuclear Security Administration. More than 12,000 plutonium pits, which serve as triggers for nuclear warheads, are stored at the plant. The soil there is contaminated by solvents, remnants of explosives and radiological elements, including depleted uranium and traces of plutonium, while the groundwater has solvents, remnants of high explosives, chromium and other chemicals from a shallow aquifer. While the sources of the soil and groundwater contamination have been eliminated, the contamination itself remains. Crews began pumping and treating the groundwater as early as 1995, said Tony Biggs, environmental programs director for B&W Pantex, which operates the site and helped do the review. The overall Pantex cleanup will continue with reports on progress issued every five years, he said. The EPA and the Texas Commission on Environmental Quality signed off on the first five-year review last fall. “It’s an effective cleanup that we’re seeing, an effective remediation,” Biggs said. Environmental officials have said the cleanup is estimated to cost around $135 million. Its effectiveness is tested by sampling water in an established network of monitoring wells to get what’s in the shallow aquifer to drinking water standards, Biggs said. Reviews will be issued every five years until Pantex officials believe the remediation of soil and groundwater is complete, he said. At that time the plant will submit a final report for review by federal and state regulators, Biggs said. George Rice, an independent hydrologist who is familiar with Pantex and its contaminants and looked over the review, said Hueni’s assertion about dropping concentrations of contaminants could be misleading. “If the concentration’s down just because the plume of (the explosive) RDX is spreading, you’re just diluting it. That’s not that good,” said Rice, who’s from San Antonio. The review states that one monitoring well has shown higher than expected concentrations of RDX and chromium. A new monitoring well has been installed to better delineate the contaminants’ plume boundaries as well as to get a better idea of how groundwater flows in the area. Traces of contamination have been found in the Ogallala, but repeated samplings turned up no additional contamination. Biggs said the work to clean up water in the groundwater is vital. The EPA and the NNSA in 2008 issued a formal decision that spelled out specific actions for groundwater and soil cleanup. Texas environmental officials concurred with the decision. The actions include two facilities that pump and treat contaminated groundwater and two bioremediation systems that pump emulsified soybean oil into the groundwater to sustain bacteria that breaks down contaminants. Contaminated soils have been fenced off and ditch liners and vegetative covering have been placed on landfills. Before the plant became the nation’s only nuclear weapons assembly and disassembly facility in 1951, waste management practices led to the release of chemicals and radionuclides to the environment, specifically in soil and the shallow groundwater.